New York - In a striking example of how global commodity markets respond to government policies blocking free trade, some 88,000 tonnes of U.S. ethanol landed on Malaysian shores through November of last year - all since June, shortly after China hiked its tax on U.S. shipments. New York - In June, the High Seas tanker ship loaded up on ethanol in Texas and set off for Asia. Two months later - after a circuitous journey that included a ship-to-ship transfer and a stop in Malaysia - its cargo arrived in China, according to shipping data analyzed by Reuters and interviews with Malaysian and Chinese port officials. At the time, the roundabout route puzzled global ethanol traders and ship brokers, who called it a convoluted and costly way to get U.S. fuel to China. But the journey reflects a broader shift in global ethanol flows since U.S. President Donald Trump ignited a trade war with China last spring. 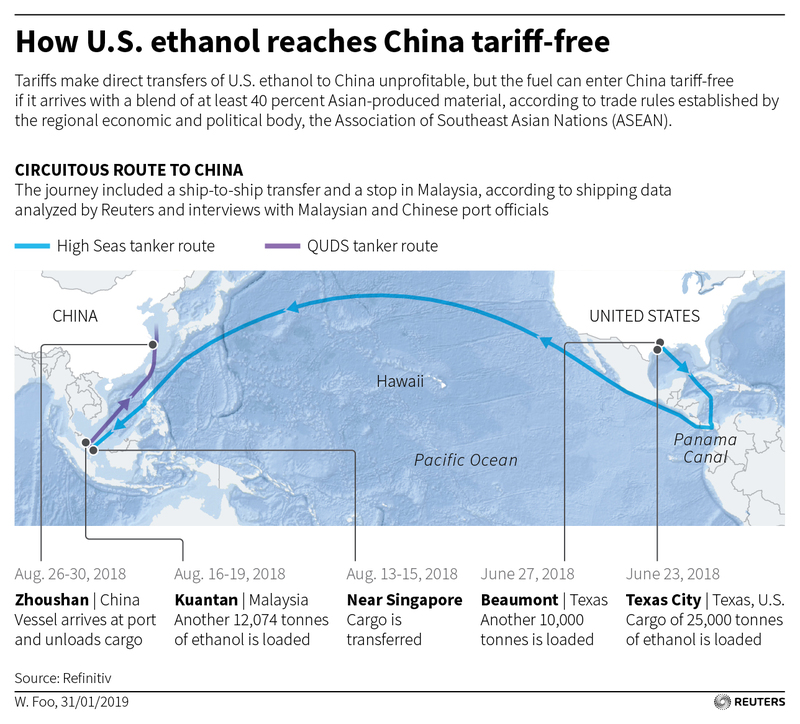 Although China slapped retaliatory tariffs up to 70 percent on U.S. ethanol shipments, the fuel can still legally enter China tariff-free if it arrives blended with at least 40 percent Asian-produced fuel, according to trade rules established between China and the Association of Southeast Asian Nations (ASEAN), the regional economic and political body. In a striking example of how global commodity markets respond to government policies blocking free trade, some 88,000 tonnes of U.S. ethanol landed on Malaysian shores through November of last year - all since June, shortly after China hiked its tax on U.S. shipments. The surge follows years of negligible imports of U.S. ethanol to Malaysia. In turn, Malaysia has exported 69,000 tonnes of ethanol to China, the first time the nation has been an exporter of the fuel in at least three years, according to Chinese import data. Blending U.S. and Asian ethanol for the Chinese market undermines the intent of Beijing’s tariffs and helps struggling American ethanol producers by keeping a path open to a major export market that would otherwise be closed. “Global commodity markets are incredibly creative in finding ways to ensure willing sellers are able to meet the demands of willing buyers,” Geoff Cooper, head of the Renewable Fuels Association, said in a statement to Reuters. The group represents U.S. ethanol producers. In at least two cases examined by Reuters, including that of the High Seas, blending of U.S. ethanol cargoes with other products appeared to have occurred in Malaysia before the cargoes were shipped on to China, according to a Reuters analysis of shipping records and interviews with port officials. Chinese merchants including the state-backed oil company Unipec notified Chinese authorities about the unusual activity last summer - which represented competition they had not anticipated under the tariff scheme, according to two industry sources. Unipec’s parent company Sinopec did not respond to requests for comment. A spokesman for China’s General Administration of Customs declined to comment. Norazman Ayob, deputy secretary general of the Malaysian trade ministry, confirmed that Malaysia exported ethanol to China this year. The ministry was unable to confirm whether it had been mixed with U.S. fuel, he said, but noted such blending would be legal under the ASEAN-China pact. Malaysia has no track record of significant domestic ethanol production, so it is unclear where the ethanol blended with the U.S. product originates. Additional U.S. ethanol has flowed in unusual volumes to other destinations since Trump’s trade war began, including other ASEAN member nations the Philippines and Indonesia, according to shipping and trade data, though Reuters could not confirm its final destination. The High Seas cargo ship was among the first to engage in the rising U.S.-to-Malaysia ethanol trade, according to shipping data from financial information provider Refinitiv and bills of lading from the ports. It loaded 25,000 tonnes of ethanol in Texas City on June 23 and then another 10,000 tonnes in Beaumont on June 27. Some of the ethanol was produced by Green Plains Inc , one of America’s top ethanol producers. Green Plains spokesman Jim Stark confirmed the loading of the company’s product in Beaumont but said it could not confirm the cargo’s ultimate destination. At the time it left Texas, the shipment was owned by units of SOCAR Trading SA, the marketing arm of the State Oil Company of Azerbaijan Republic, according to the bills of lading. The shipment was initially destined for the Philippines. But after it crossed through the Panama Canal and reached the waters near Singapore in mid-August, the High Seas transferred its cargo to the QUDS, another tanker, according to the Refinitiv data. Vincent Mohy, general counsel for SOCAR, said that the firm sold all of the U.S. ethanol at the time of the transfer to the QUDS and that it made clear to the buyer the fuel originated in the United States. Mohy declined to name the buyer. The QUDS landed in the Malaysian port of Kuantan days later and took on another 12,074 tonnes of ethanol before heading to the Chinese port of Zhoushan and emptying its hold by the end of the month, according to the shipping data, a Chinese port official and two Malaysian port officials. According to one of the Kuantan port officials and a source in the Malaysian government, the cargo on the QUDS was sold by Malaysia’s Rich Greenergy Sdn Bhd to China’s Zhanjiang Industry Petrochemical Company Limited. Kelvin Shum, Rich Greenergy’s CEO, declined to comment, saying he had signed a non-disclosure agreement about the deal. Efforts to reach Zhanjiang were not successful. The convoluted voyage was replicated in at least one other case, that of the Maritime Tuntiga. That ship also carried Texas ethanol into Southeast Asia this summer, transferring its cargo into another vessel – the Taibah – near Singapore. Like the QUDS, the Taibah moved on to the port of Kuantan in Malaysia, picked up about 12,000 tonnes more ethanol, and then moved on to Zhoushan, according to the shipping data and the Kuantan port officials.